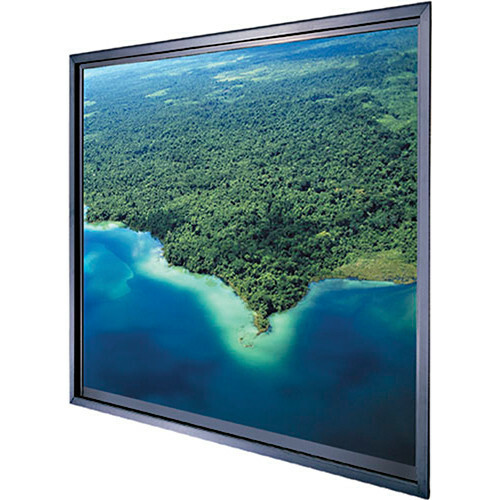 The 52 x 92 x 0.25" Polacoat Da-Plex In-Wall HDTV Format Rear Projection Diffusion Screen with Base Frame from Da-Lite is made with an acrylic plastic substrate that minimizes breakage and is easy to handle. This screen requires precise installation specifications since the choice of image size depends on how much in-wall space is available. The screen size and frame should be determined by a contractor or site manager based on the facility's dimensions and limitations. The Base Frame features mitered corners to eliminate rear light leaks without caulking. It is made from 3/8 x 7/16" extruded aluminum U-channel. The frame dimensions equal the viewing area plus 2.5". The frame has a black anodized finish. It must be noted that the Da-Plex substrate requires an optional diffusion coating to function properly and should be mounted with the coated surface facing towards the audience. It is strongly recommended the customer contact Da-Lite for precise purchase information, selection of the appropriate diffusion coating and frame choice. Box Dimensions (LxWxH) 102.0 x 62.0 x 8.0"